JNV Gadchiroli (Jawahar Navodaya Vidyalaya), Gadchiroli published a new job notification for PGT Posts.. The willing candidates are informed to see the latest notification March 2019. Qualification required M.Sc. and More. Walk In Interview On 30th March 2019. For More details of JNV Gadchiroli Recruitment 2019 Read Below. Education Qualification: M.Sc. and More. For Post wise Education Details follow the detailed advertisement. Age Limit: 21 years to 60 years. 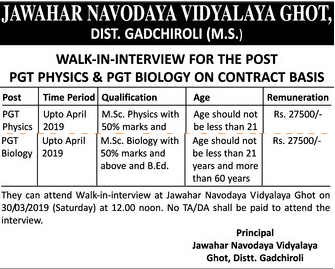 Interested & Eligible candidates may attend for walk in interview along with all the documents addressed at Jawahar Navodaya Vidyalaya Ghot, Gadchiroli. Application starts offline 23-03-2019. Last Date of application is 31-03-2019.